Release your inner wildlife explorer by taking part in this safari! This safari offers you journey inside the Kruger National Park where on the second, third, and fourth day you can really experience what the Kruger National Park has offered, as you will be in the park from dusk till dawn every day. Departure would be from Johannesburg, Maputo, or Nelspruit areas, and pick-ups would have to be quite early on the first day to give you enough time to reach the Kruger National Park before gate closing time. Come and explore this amazing country and wildlife with WhereTo Tours! You will be staying at Skukuza Rest Camp in Kruger National Park, South Africa. You could choose to stay in a tent or a bungalow. Accommodation at Skukuza varies from small, but comfortable, bungalows to tented. Each site has an outside braai (barbecue area). Tented accommodation shares the ablutions, cooking, and wash-up facilities. Staying at Skukuza means you are allowed to use facilities such as the swimming pools and watching free movies at the outdoor cinema. This accommodation in Kruger National Park features African-styled rooms with either two or three beds. Each bungalow is equipped with an en-suite bathroom fitted with either a shower or bath. Some units are fitted with air-conditioning while others have fans. The units also feature kitchenettes which vary from bungalow to bungalow. Luxury tents fitted with double and single beds. Each tent has a kitchen and seating area. Tents have electricity outside area and a fan. A braai is built on each site. You will be collected at O. R. Tambo International Airport (JNB), Johannesburg, or any other destination in and around Johannesburg. You will drive along a scenic route to Numbi Gate of the Kruger National Park. You use Numbi Gate as it is the closest gate from Johannesburg. The duration of the drive will be anything between four and five hours. It all depends on where the departure point is. You will be collected from Nelspruit airport, Kruger Mpumalanga International Airport (MQP), or any other destination in and around Nelspruit. It is not a long drive and you will make use of any of Numbi, Phabeni, or Malelane Gates of the Kruger National Park. It all depends on the departure point. The duration of the drive to the Kruger National Park would only be between 30 and 60 minutes. Your game viewing will start as soon as you enter the Kruger National Park. After the game drive, towards the evening and before gate closing time, you will arrive at the rest camp, where you will book in and freshen up before dinner. 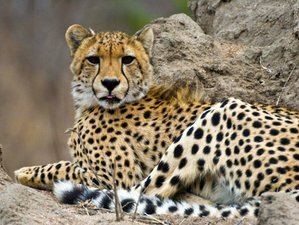 Your day will start very early in the morning as this is the best time to see the elusive animals of the Kruger National Park, especially lion and leopard. You will start your day with a cup of coffee or tea and rusks or biscuits (cookies), and make sure that you exit the gates of the rest camp as soon as they open. Starting your game drive, you will visit rivers, waterholes, and lookout points in the search of the Big Five and other animals that you might want to see. You might even visit the waterhole where the famous battle at Kruger took place. Note: Please note that this is just an example of what the safari could be like but can change due to unforeseen circumstances. Game drives, exploring the camps & roads of Kruger National Park. Learn about the park and its history. In the heart of the Lowveld, stretching for 352 kilometers from north to south along the Mozambique border, one of the world's foremost national parks can be found. This is the Kruger National Park, a wildlife sanctuary larger in area than Israel. Covering 19,624 square kilometers and averaging 60 kilometers in width, Kruger provides a refuge for hundreds of mammals, bird, fish, and insect species, types of trees and shrubs, and thousands of small plants. The Kruger National Park is world-renowned as are several of the luxurious private reserves on its western boundary. It was established in 1898 to protect wildlife and covers an area of two million hectares. Truly the flagship of the South African national parks, Kruger is home to an impressive number of species: 457 trees and shrubs, 1,500 smaller plants, 49 fish, 34 amphibians, 114 reptiles, 507 birds, 147 mammals, and countless insects. Apart from the irresistible magnet of this wildlife mecca, some spectacular scenery can be viewed in the mountainous area known as the Panorama Route, en route to the Kruger Park.